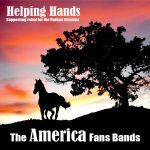 This 19 track compilation CD is by 'un-signed' bands who are fans of the music of AMERICA and who are featured regularly on the America Fans web site. The CD is available now for download from Amazon.com for $8.99. All profits will go to the LDS Church Humanitarian Aid Fund for Haiti (www.lds.org/haiti-relief/relief/landing.htm) to help support the people of Haiti as they recover from the most recent disaster. America Fans Bands is a group of artists and bands whose musical production has been influenced in many different ways by America, one of the best rock-n-roll bands of all time. These artists have recorded one or more America covers during their careers and have played their songs during live concerts. Another common thread is that they often visit the America Fans Home Page created by Steve Lowry which is a great tribute to America and their fans. Many fans feel that it's one of the best web sites about a band on the entire web. In the past, these artists have contributed to the site by sending Steve some cover or tribute songs, writing chords and tabs, or various other things. One day Freddy Belfiore, guitarist/singer of Distillery, had the idea to put all these covers together to create a digital downloadable CD whose proceeds would go to support victims of the Haiti earthquake. Freddy started to contact these artists with one basic idea. Let's combine an America cover from each artist or band with an original song of theirs as well. Their replies were all enthusiastic. Everyone wanted to put his signature on this project and everyone had their say in the final result. The CD is now complete and is available from Amazon.com. It wasn't an easy job to pull this all together since it involved people from four different nations and two different continents. But in the end the desire and will to help overcame all of the obstacles. Actually, we don't know yet how things will turn out but we hope this is just the first chapter of many more to come. Now, it's up to you who are reading this page to pitch in and help the people in Haiti while enjoying some America influenced music. And by all means, share this with your friends.